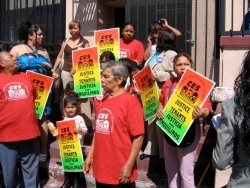 Tenants' Rights Legal Clinic: Wednesdays 7 pm & Saturdays 10 am, at the Plummer Park Senior Center, 7377 Santa Monica Blvd, West Hollywood, just west of La Brea Ave. Welcome to the Coalition for Economic Survival (CES) web site. 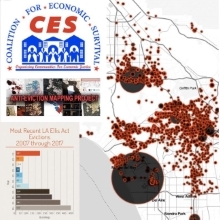 The Coalition for Economic Survival is a multi-racial, multi-culture grass-roots community-based organization that has been dedicated to organizing low and moderate income people to win economic and social justice throughout the greater Los Angeles area since 1973. 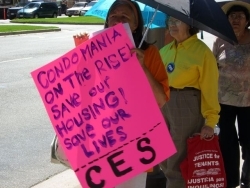 CES is currently working to empower tenants living in private and HUD subsidized housing to fight to ensure tenants' rights and preserve quality and safe affordable housing. We invite you to use the comprehensive information we have provided as a resource to help you ensure your tenants' rights and preserve your affordable housing. Included at this web site is information on renters' rights laws and regulations, forms and flyers, such as forms to file housing code and rent control violation complaints, links to government agencies, legal services and other important organizations, details on CES' Tenants' Rights Clinic, reports on CES members participating in activities to win additional rights, alerts to upcoming events and, most importantly, information on how you can get involved in fighting for justice for you and your community by becoming a CES member. Get a CES T-Shirt with your $20 donation!